Do you often get woken up at midnight by mosquitoes or other pests? Are you tired of cleaning droppings or dead rodents? Are you still using chemical insecticide that may harm your children and pets to kill pests? POP VIEW Ultrasonic Pest Repeller - Reject Pests Effectively, Easily and Safely ! Low Consumption, High Efficiency: 360°all directional expelling on pests. 0.096 kWh per day per pest repellent. Keep plugging in pest repellent all day for continuous effect. POP VIEW will provide best service for all our customers, which is our bounden duty, therfore please don't worry about and we will deal with for you within 24 hours. ✅ EASY TO USE - JUST PLUG IN.Please install our item at 80-120cm away from the floor . Just plug our electronic mice repellent into the socket and let it do the rest. And should be vertical to the floor and plug to the outlet. DUE:Please note that if you have a hamster pet at home, please DO NOT use this Ultrasonic Pest Repeller. ✅ WIDE EFFECTIVE COVERAGE. 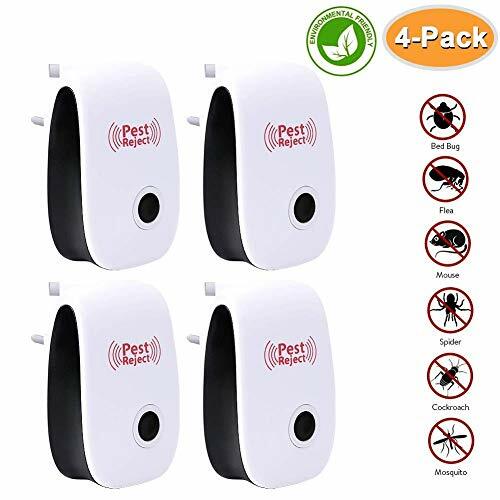 The Ultrasonic Pest Repellent is effective for an area up to 80~120 Square Meters.Since ultrasonic sound can not penetrate wall and solid object, one room one unit is recommended. As for large storage area with serious pest infestation, additional units is required. ✅ USE FOR MANY PLACES. This pest control ultrasonic can help you drive away all the pest, like spiders, mice, mosquitoes, rats, roaches, ants, snakes and so on. Suitable for kitchen, living room, bedroom, bathroom, warehouse and basement. ✅ 100% SATISFACTION GUARANTEE. ultrasonic pest repellent provides lifetime quality assurance. Any problem we will deal with it for you within 24 hours. We hope this pest repellent will build a warm and comfortable environment for you.